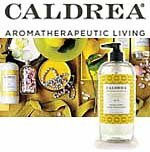 Caldrea Counter Top Spray, Kitchen Cleaners, Soaps and Laundry Products | P.C. Fallon Co.
Caldrea makes amazingly effective and delightfully fragrant cleaners, lotions, candles, laundry products, and more. Wonderful fragrances are combined with the best formulations of kitchen, laundry and body products. Caldrea products do not contain parabens, phthalates, formaldehyde, ammonia, chlorine bleach, phosphates or petroleum distillates. Choose from counter top cleaners, hand soaps, laundry detergents, fabric softeners, dryer sheets, candles, hand lotions, linen sprays and more. Caldrea products are proudly made in the USA.